QATIF, December 26, 2004 -- Crown Prince 'Abd Allah ibn 'Abd Al-'Aziz Al Saud, First Deputy Prime Minister and Head of the National Guard, Sunday inaugurated Saudi Aramco's Qatif Producing Plants mega project. The inauguration celebrated the completion of the 800,000 barrel-per-day capacity crude oil field development program. In addition to the crude, the plants have the capacity to provide 370 million standard cubic feet of associated gas daily. The Qatif Producing Plants program was completed just two years after construction began in August 2002. The program, which required 1.8 million work hours to design and 70 million work hours to construct, brings with it the latest technological advancements to increase operational efficiency and environmental safety, from an onshore smokeless flare system to a new, 99-percent-efficiency sulfur recovery system at Berri Gas Plant. To complete the program, about 15,000 laborers, craftsmen and professionals of various nationalities worked in different worksites, in and out of Kingdom. The Minister of Petroleum and Mineral Resources, Ali I. Al-Naimi, said that he and the Kingdom's petroleum sector employees were happy that the inauguration of Qatif Producing Plants Project was being conducted by Crown Prince 'Abd Allah. Al-Naimi explained that the Saudi petroleum industry is progressing in a steady and studied manner to sustain its leading effective role on the local and global level, in accordance with the directives of the Custodian of the Two Holy Mosques King Fahd and the Crown Prince. The Minister concluded that "the Qatif Producing Plants project will boost the Kingdom's producing capacity and will contribute to expanding and promoting the national economy. The project comes as part of the mega petroleum projects implemented over the past years, as well as other major projects whose planning is under way, and which will be implemented over the coming years." 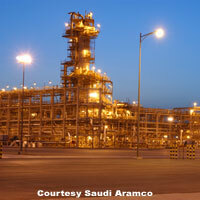 Saudi Aramco's president and chief executive officer Abdallah S. Jum'ah said that the Qatif Producing Plants Project provided Saudi Aramco with an opportunity to demonstrate its unique capabilities by implementing many advanced technologies that increased the project's efficiency and made it economically advantageous. "Such technologies include, but are not limited to, drilling horizontal extended-reach and multi-lateral fishbone wells; applying the FIELDBUS technology which allows the connection of many observation, measurement and control instruments in a single cable system; using the latest advance acid recipe to improve well performance; installing improved gas turbines and smokeless flares; and using one of the world's most advanced and efficient sulfur recovery systems, where the sulfur recovery rate reaches 99 percent," Jum'ah said. The Qatif Field, located north of Saudi Aramco's Dhahran headquarters in the Eastern Province, amounts to more than 195 square miles of area, including northern and southern dome structures. This onshore component of the project has the capacity to provide 500,000 bpd of Arabian Light Crude. The offshore Abu Sa'fah field - part of the Qatif Producing Plants program - contains an estimated 6.1 billion barrels of oil reserves below more than 65 square miles of seafloor. In addition to the dozens of wells that have been drilled both onshore and offshore, new gas-oil separation plants (GOSPs) have been built to accommodate the new production, and the existing Berri Gas Plant has been modernized so that it complies with the Kingdom's sulfur-dioxide emission requirements. The 300,000-bpd Arabian Medium production from Abu Sa'fah is shipped through a new 42-inch submarine pipeline extending 60 km to the new onshore GOSP for further processing and stabilization. The Abu Sa'fah stabilized crude is shipped to Ras Tanura Terminal for export. The program also included building a network of pipelines linking facilities to each other and the Ras Tanura and Ju'aymah terminals, and construction of a communication network consisting of a 90-meter communications tower, 250 kilometers of fiber optic communications cable linking all facilities, and a digital infrastructure that links Qatif facilities to the Saudi Aramco Communication networks. The Qatif Producing Plants program marks another milestone among Saudi Aramco production facilities in that it is the first plant to be self-sufficient in power and steam, through the construction of an on-site cogeneration plant. Exhaust from the power station is harnessed to produce steam for the plant, which achieves cost-savings and results in reduced emissions.